Donald Hankey was a writer who saw himself as a ’student of human nature’ and peacetime Edwardian Britain as a society at war with itself. Wounded in a murderous daylight infantry charge near Ypres, Hankey began sending despatches to The Spectator from hospital in 1915. Trench life, wrote Hankey, taught that ’the gentleman’ is a type not a social class. In one calm, humane, eyewitness report after another under the byline ’A Student in Arms’, Hankey revealed how the civilian volunteers of Kitchener’s Army, many with little stake in Edwardian society, put their betters to shame theless. A runaway best-seller on both sides of the Atlantic, Hankey’s prose vied in popularity with the poetry of Rupert Brooke. After he was killed on the Somme in another daylight infantry charge, Hankey joined Brooke as an international symbol of promise foregone. British propaganda backed publication in the-then neutral United States, yet at home Hankey had to dodge the censors to tell the truth as he saw it. This, the first scholarly biography, has been made possible by the recovery of Hankey papers long thought lost. Dr Davies traces the life of an Edwardian rebel from privileged birth into a banking dynasty that had owned slaves to spokesman for the ordinary man who, when put to the test of battle, proves to be not-so-ordinary. 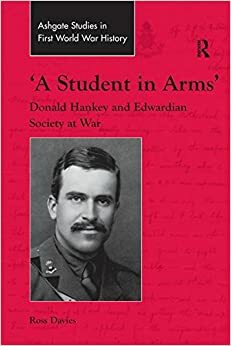 This study of Hankey’s life, writing and vast audience - military and civilian - enlarges our understanding of how throughout the English-speaking world people managed to fight or endure a war for which little had prepared them.